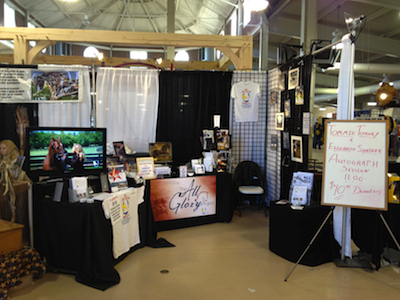 From November 2nd through 4th, The All Glory Project was hosted by Viginia's premier horse expo, the Equine Extravaganza. Visitors were treated to special presentations during the evening horse shows, in which the likes of Elizabeth Shatner, Tommie Turvey and Guy MacLean educated the audience about the special bond between horse and soldier, and paid tribute to the two- and four-legged souls that have scrificed for our country. There was also a presentation to raise wareness about equine-assisted therapy for the military and their families, with a special presentation of the Colors by participants of the Lonesome Dove Veterans Therapy Riding Program. Visitors also had the opportunity to visit the The All Glory Project booth, where they could learn more about animal-assisted therapy for Veterans and their families, and purchase special items as donations to the Project.